Few weeks ago a friend of mine told me that a new pizzeria opened in Burj Hammoud and that I should definitely try it. La Strada is Italian for the street. Pizza is indeed considered as street food in Italy and a staple in any Italian home. To us its fast food, to the Italians its tradition where less is more and quality ingredients are what make all the difference. 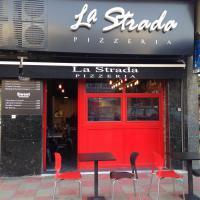 La Strada is a small pizzeria in the main road branching from Burj Hammoud’s main square. We were greeted with a nice manager/owner at the door with a big smile and seated. The big brick stone oven was being served by a round faced chef and a young sous chef. A nice simple interior, although not traditional Italian and more New York pizzeria it made you feel relaxed and ready to eat. I tried everything on the menu. Yes, everything. The pizzas were generous in size and relatively cheap in price. The menu was handed to us by the manager and we got lost in the many options they had. The options are basic , as should be, yet they are diverse and would sure meet all tastes. They even have a dessert pizza with chocolate on it. We ordered the Four Cheese Pizza, Basturma Pizza, Margarita Pizza, Pomodoro Pizza, Mushroom Pizza, Goat Cheese Pizza, Vegetarian Pizza. The crust was spot on perfect. The toppings did not go over the top and were not non existent, just a perfect balance. Margherita: Tomato Sauce and Mozzarella Cheese. Perfect balance, simple and straight forward. I only wish they would add a few fresh basal leaves to the top before its served. Pomodoro: Its basically the same as the Margherita pizza yet they added cherry tomatoes to the top and a sprinkle of dry oregano and topped with fresh arugula. Its very nice and a fresher version of the Margherita pizza. Mushroom Pizza: Loaded with fresh mushrooms and topped with fresh arugula leaves. One of my favorites. 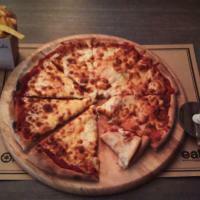 Four Cheese Pizza: A mix of 4 cheeses topped their tomato sauce. It was very good, however it wasn’t clear what the four cheeses were exactly. I would perhaps have one of the cheeses diced into cubes instead of being shredded with the other cheeses and add more of the blue cheese to make the taste more distinctive and texture more diverse. Vegetarian (Veggie) Pizza: My favorite between them all. Rich with flavors and ingredients which are not “”loaded”” on the crust. Zuccini, eggplants, mushrooms, green peppers, and olives rested on that tomato sauce. The vegetables were thinly sliced and didn’t overpower each other nor the sauce. A definite must try. Basterma Pizza: My second favorite. An Armenian twist on the Italian tradition. The spiciness of the basterma compliments the tomato sauce and its balanced by the fresh arugula. I would suggest that they shred the basterma to make eating the pizza a bit easier since when you bite to the slice of pizza you end up with one bite that pulls the basterma off the crust and you eat the remainder of the slice with no toppings. Goat Cheese: My least favorite of them all. I couldn’t taste the goat cheese on that pizza, so it just seemed like I was eating the Margherita pizza with something odd. 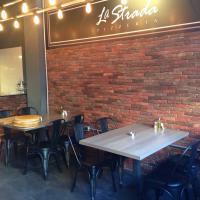 La Strada is here and its here to stay. I really hope they don’t change their prices and they don’t expand too much the manager was talking about adding pastas and sandwiches. If you they maintain the high quality and they manage to keep the prices down , I’m sure they will bloom and stick around for a long time. Go try it, and as their slogan says : Keep your family close and your pizza closer. ← Koi Lounge & Sushi Bar: Its closing soon, not soon enough though!